This is just a quick post about my new colour. I got my hair cut and coloured on Wednesday night even though I should have been doing readings doh! I never really get anything new with my cut, just a regular trim and reshaping of my layers. I've been going to my hairdresser for something like 10yrs now and she just knows I'll say "just a trim and reshape the fringe" LOL which is why I play around with my colours. 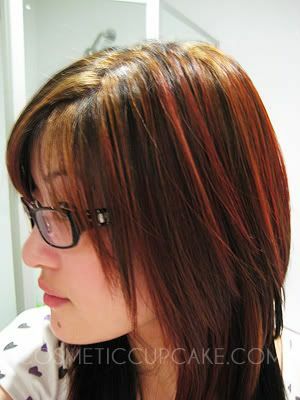 I get 1/2 a head of foils and lately I've been sporting copper and red foils but this time I went for a lighter brown. Sorry for the dodgy photo!! Can you see the lighter foils on top? I'll post more over the weekend as I just recieved my Konad haul from wowsocool.com! I like the color you choose for your highlights. Everybody is getting a prespring haircut. I need one too.